And a Huge Thanks to Our Sponsors!! The crew behind the East Bay Mini Maker Faire wants to shout out a huge thank you to all of our sponsors. Their support helps make this exciting, interactive, crazy-fun day possible. Brushstrokes–the Berkeley-based pottery painting and mosaics studio will have a booth at the Faire where you can create your own jewelry. They will fire it in the kilns at Brushstrokes after the Faire, and then host a Mini Maker Faire after-party at Brushstrokes in late October where the clay jewelry can be picked up. Super cool! ClifKids–A periennel supporter of family events, Clif jumped right on board for the East Bay Mini Maker Faire. Check out their craft project using recycled packaging materials. While you’re there, grab a snack to keep you making. 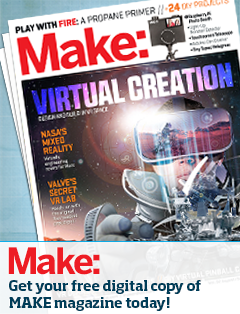 MAKE Magazine–Where Maker Faire started: the nation’s best DIY projects magazine, MAKE celebrates your right to tweak, hack, and bend any technology to your own will. 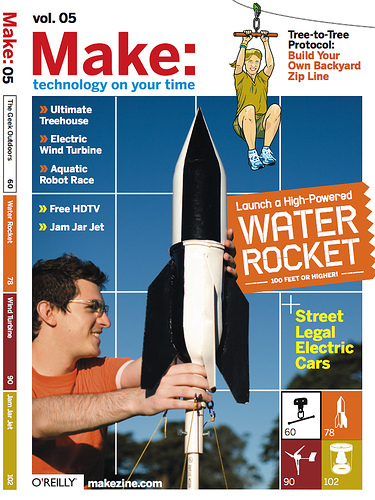 MAKE is published quarterly, and is loaded with exciting projects that help you make the most of your technology at home and away from home. Keep the making going through the whole year—subscribe today! Vessel Gallery–Owned and run by the amazing Lonnie Lee, Vessel Gallery is a must-stop on the growing Oakland art gallery scene. Vessel’s new exhibition presents the latest work of Cyrus Tilton, a sculptor and inspirational artist for makers of all sorts. “The Cycle” is a site specific installation where natural science meets creepy kinetic deliverance. Do not miss this spectacle of a show running October 4th-29th! Orange Door Properties–Orange Door Properties is an independent real estate brokerage with experience serving homeowners and prospective homeowners in Oakland, Berkeley, Piedmont, San Francisco, Alameda, Emeryville, Albany and Kensington. Orange Door is a certified ecobroker® and a green business using sustainable business practices. They are also extremely enjoyable people, and experts in their field. Look for the Orange Door Properties/Park Day School seed bomb booth at the Faire! East Bay Depot for Creative Reuse–Can you say Swap-O-Rama-Rama? The East Bay Depot for Creative Reuse is the source for any creative endeavor and a mainstay of products for our onsite repurposing textiles mash-up. They’re a big supporter and supplier for makers throughout the East Bay. East Bay Bicycle Coalition— Be healthy, avoid parking, and reduce your carbon footprint. Bike to the event and the friendly people from the East Bay Bicycle Coalition will park and store your wheels for you. Become a member while you’re there and help make the East Bay a better place to ride. Park Day School— The East Bay Mini Maker Faire is fortunate to have Park Day School as its sponsor and non-profit beneficiary. Park Day School is a diverse, independent bridge-K through 8th grade school with a 35 year history of progressive education. Park believes a successful learner is one who is confident, caring, and creative—very much the traits of a Maker. The thank you list goes on: East Bay Express, Music for People and Thingamagigs, 510 Families, Edible East Bay, VineCrowd, and Studio One Art Center. YOU ARE THE BEST!